Countless parents send their kids to martial arts programs, such as Krav Maga Kids, but most have no clue what is going on inside the class or what, if anything, of value is being taught. 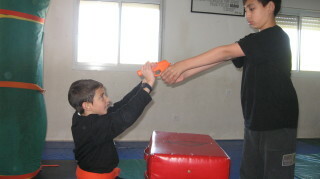 This section is designed to maximize what your child will gain from Krav Maga martial arts training by educating you to be a super martial arts parent. Years ago I began teaching Krav Maga to kids who wanted to learn how to kick and punch. Today most of the parents who send their kids to our martial arts program have little or no interest in karate or self-defense. So why do they enroll their kids? I have learned through my students that martial arts offer many more benefits than I had ever imagined. I have learned that martial arts can truly transform the lives of practitioners, both young and old. What follows are some of the benefits the parents and I have discovered. Many students had difficulty in understanding how to go from point A to point B. They had the desire to reach point B, it was a goal but they could not figure out how to get there. This led to great frustration and anger. They were accused of being lazy, this lead to resentment and a lack of desire to even try. In martial arts they understood the process we follow. They saw that one cannot just jump from white belt to black belt. First they achieved a yellow stripe, then a belt. First they learned a very simple technique, then a more advanced one. They saw how efforts yielded gradual results, rewards, and recognition. This motivated them to try harder, to attend classes more often. Krav Maga and all martial arts are based on repetition, they saw how a task which appeared impossible at first became easy later on as the body and the nervous system adapted to it. They learned that no goal is impossible and that they can become the person they admired. Earning a colored belt is one of several indications that you are moving up and making the grade. Many children lack self-confidence and self-esteem. Learning a complicated skill like karate or judo gives them a sense of accomplishment and achievement. They now have a skill that others do not have, they feel special. They set out to accomplish something and they did it. All sports have value. Instead of just sitting in front of the computer or TV kids should be out playing. I found a site full of ideas to make sports fun for all kids, not just the super athletic ones. You like to fight? You like to hit? That’s O.K. You need to let off steam? That’s O.K. You can hit the punching bag; you can fight another student, with his consent and with the teacher’s supervision. The student learns that without these pre-conditions he is not allowed to hit or fight. Major research has shown that karate helps as a treatment for Attention Deficit Disorder, more than other sports. The dojo is a traditional place and there are many rules: how you enter and leave, how you dress, how you behave. The student quickly learns that if he is to stay - he must abide by these rules. Martial arts training is based on long-term commitment. You can not earn a black belt in one year or even two. You learn patience and hard work, any goal worth achieving is worth working hard for, the black belt is a testament to hard work and prolonged effort and that is why it is so respected in all walks of life. It is tough being a kid, don't fool yourself. Yeah, we love 'em but kids can be cruel to each other. Sometimes we think the wise cracks and jokes bounce right off them, but in some cases children can be scarred for life. Not every kid is a natural athlete. The coaches favor the "winners", the kids who bring home championships. The kids themselves tend to shun the less gifted, I know, I was one. When I was in third grade the teacher divided up the class for a soccer game. I didn’t care for soccer and was not very good at it. The teacher foolishly allowed the kids to choose the teams. As each team chose a new member she wrote the name in the appropriate column on the board. The less gifted soccer players dreaded this moment; we wondered who would suffer the humiliation of being chosen last. Alas, it was me. Of 23 kids in the class, including girls, I had the honor of being chosen last. Not only that, but since it was an odd number they put my name on the side, everyone knew I would not contribute to either team so it did not really matter who's team I was on. Now I am a Krav Maga teacher, a respected 6th degree black belt in one of the toughest styles on earth, but I have never forgotten that lesson. I know what it is like to be that kid. That's the kid who when he gets up to bat in baseball the other kids shout, "Just get a walk!" His teammates have no confidence in him and he feels it. He knows if he fails he brings down the whole team, other players won't get a turn to bat that inning, he might leave players 'stranded' on base. That's the kid who once kicked the soccer ball and missed an easy goal or who fumbled a football and lost the game. No one lets you forget that. Soon you don't bother even trying. The message is, "Since you might fail, why even try?" Sounds like advice from Homer Simpson but that's what many kids feel. Trust me, I know. Don’t' worry, here comes martial arts to save the day. In martial arts/Krav maga training you represent only yourself. It is not one of those dreaded team sports. There is no audience heckling you, no angry "soccer mom's" in the stands. In Krav Maga you progress at your own pace. You are in competition with no one. Your rank is your own. Gradually you notice changes and you become more confident. You will succeed. You might have to do that kick ten times, or a hundred or a thousand, but you will eventually get it right. A good instructor will encourage you and remind you of that fact. Many of the biggest names in martial arts today, even movie stars, started martial arts training because they were picked on by school yard bullies. There are no "secrets". A Shaolin monk was once asked for the secret of their unusual martial arts excellence. He said, "We train hard all day long, every day." That is the only 'secret'. In martial arts you are with a group but you are still an individual player. You learn to handle group dynamics; you learn to work with a partner. But ultimately your success is yours and yours alone. No one will criticize you for not "winning" a fight; no one will suffer as a result of you failing to block a punch. As you see your Krav Maga techniques improve, your confidence will grow. You will earn new ranks, learn more exciting techniques. You will learn that you can achieve any goal you set your mind to. And then, if you feel like it, you can try kicking that soccer ball again, but this time with confidence. Now, go get 'em kid. Growing up isn't easy. You are born an individual, with your own talents and voice. You have your own unique personality. Soon you discover that from the moment you are born you are being programmed, or conditioned, to behave a certain way. Your "voice" is being stifled. As time goes on you realize you are being judged and graded by standards you don't understand. Suddenly it is vitally important how you measure up compared to others. You are judged in school with your grades, you are judged on the competitive playing field with your sports ability. Life for a kid can be hell, and sometimes he has no one to turn to…. A child who is a failure at sports will quickly develop a lack of confidence and may be afraid to even try. Playing for fun, without the competitive element, is almost unheard of. What is the point? What's worst is that most of our sports are team sports so if you are a failure no one will want you on their team. Sports can be great fun, but for the awkward non athlete it could be living hell. In martial arts/krav maga you have the advantage of being part of a group without having to play as a team. You can share the camaraderie of your friends at the dojo while still being on your won individual path. 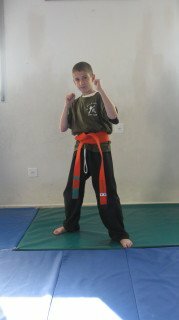 Martial arts is an individual activity and each individual child progresses at his own pace. Your belt is your own; only you wear it. It indicates how much time and effort you put into your self improvement. If you choose to spar (fight) with another student, you represent only yourself, not the entire team. This is truly an activity where you can put your heart and soul into it and develop at your own pace, steadily progressing without the pressure of 'wining or losing' or making the playoffs. I have never done a study on the effects of martial arts on the growing up process. However, as a martial arts teacher with over 20 years experience I have heard testimonials from many parents. •	Martial arts was the one activity that gave my daughter confidence. •	As a result of my son's martial arts experience he started watching what he eat. •	Martial arts training improved their balance and coordination to the point that they were able to drastically improve their abilities in traditional group sports. •	Martial arts gave them the esteem that had lacked. •	Martial arts training gave them health benefits and exercise habits that have remained with them throughout their lives. These stories helped solve a personal mystery for me. When parents are very eager to sign up their children for lesson I wondered where the enthusiasm came from. The answer: They had trained as kids themselves and experienced the benefits first hand. The martial arts are a proven path for personal success. You love your child. You want to give them the very best opportunities in life. You wisely decided that martial arts provides a way of empowering children and adults and you have decided to give this gift to your child. Now they question is, with so many styles and schools out there, how can you, the novice, possibly know which one to choose. It is best to consult with an honest expert. That is when people turn to me. I have trained in many styles; krav maga, karate, kickboxing, jujitsu and more. People often ask me "what is the best style?" I tell them, before I answer your question I need to first ask you a question, "What are you looking for?" Are you looking for discipline? You might choose a traditional form of karate. Are you looking for spirituality? Art? Physical fitness? Sporting competition? A place to meet new friends? Do you have a child suffering from ADD or ADHD? Or are you looking for street self defense? Your answer will determine what kind of a school is right for you. For sport you might chose Taekwondo or Judo. For health and relaxation you might chose Tai Chi Chuan, for a cultural experience you might chose from the many animal styles of Chinese kung fu. There is no right or wrong. I have a friend who is a 5th dan black belt in a traditional karate style, he says for self defense he carries a gun; he comes to the dojo because he simply enjoys the art. Whether it is for you or your child you must first ask that all important question, "What is it that you want to get out of martial arts training?" In order to avoid frustration and, ultimately, burnout, you must clearly define what it is you are looking for. If you are looking for an outstanding workout, you can't beat Brazilian jujitsu; the grappling demands a great deal of endurance and strength. It also has many self defense applications. Kickboxing also offers an excellent cardio workout. Traditional karate has a great deal of mechanic repetition; this might be good for a child suffering from attention deficit disorder. It might give him a sense of discipline and boundaries. For street survival my favorite is Krav Maga or any style where the instructors have police or military training experience. If you are looking for a cardio workout you might be frustrated working on krav maga gun disarms, for instance. If the lesson is focusing on a technical skill, you might not break a sweat that day. You have to decide what your goal is, what aspect of martial arts do you want to emphasize. A great place to check out many outstanding schools in the United States is with my good friend Charlie Barrett. He has a site called dojos.com and has spent a great deal of time putting together an exhaustive list of schools covering many styles. karate parent you can be. Younger children, ages 5 to 6, lack the fine motor coordination that older children have. It is important to design a krav maga training program and workout that is within their range of capabilities and, fun for them. This is the Japanese martial arts word for "Stop". It is a very important word to learn early on. This is the word the krav maga instructor will use to tell everyone to stop so that he/she can move on to another technique. It is also the word a fighter will use to indicate that the technique being applied against him is painful and his partner should stop at once. Failure to internalize this concept of stopping at once can lead to injuries and a disorderly class. I begin by saying "Start"; the kids run around, shout and jump and are allowed to go crazy, with the clear rule that no one is allowed to touch anyone else. When I say "Matte" they must all freeze like statues. It is a fun and educational 'game'. I line up the punching shields on the floor with sufficient space between each one. The child will do a 'bunny hop", jumping with both legs over the shield. It is a fun drill and it develops leg strength and explosive power, two elements that will be crucial to their future Krav Maga training. We stack up a bunch of punching shields to create a "wall". The kids take turns running running up to the wall and jumping over it. We have three different levels or heights so each kid has a height they can handle. Similiar drills are used in actual krav maga training in the military. Again we build a wall. This time the kids run into it and smash it. We call this "courage training". This is part of the krav maga overcoming fear and hesitation training. Krav Maga kids learn how to do various kinds of rolls; forwards and backwards. Krav Maga kids run up to a punching shield and kick or punch it. Running knee kick is a technique where they run up to a shield, jump up at it with a knee kick and shout. This is an actual self defense technique used to break out of a crowd. In krav maga security guard training this would be part of "aggressiveness" training. Together, these drills create a fun and practical Krav Maga training session for younger children. I promise to use it only to send you Krav Maga Warrior News.